Two men have been charged over allegations of racially offensive remarks made at last week's Scottish Premiership clash between Aberdeen and Rangers. The men, who are aged 47 and 57 and are both from Aberdeen, are alleged to have made the remarks at Pittodrie during Rangers' 4-2 win. An investigation was launched after Police Scotland were made aware of an incident in the south stand during the game by a number of spectators. Police Scotland confirmed on Tuesday that a report had been sent to the Procurator Fiscal and the men will appear at Aberdeen Sheriff Court at a later date. Sergeant Ross Geddes of the Divisional Alcohol Violence Reduction Unit (DAVRU), said: "I would like to thank those who brought their concerns to our attention and to those who assisted with our investigation. "Offensive behaviour of any kind will not be tolerated and anyone who becomes involved in disorder will be dealt with robustly." Rangers claimed victory thanks to two goals from Alfredo Morelos, a penalty from James Tavernier, and a late strike from January signing Jermain Defoe. 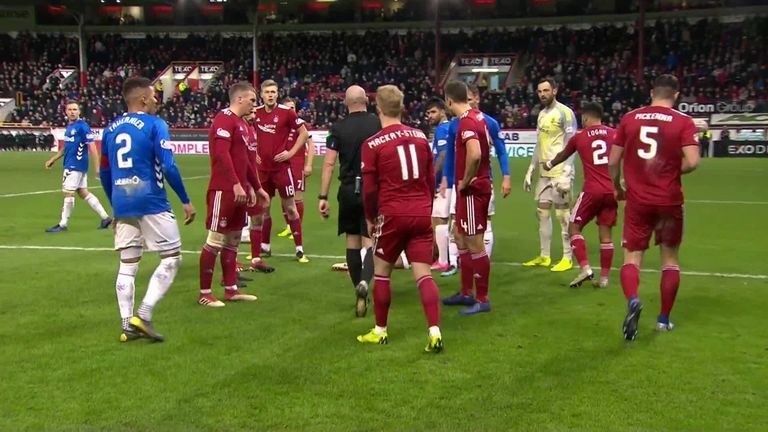 Morelos and Aberdeen's Scott McKenna were issued with red cards in a full-blooded clash.